Espoo, with 280,000 residents, is the second largest and one of the fastest growing cities in Finland. In 2017 the City of Espoo and Fortum signed an agreement to make Espoo's district heating carbon-neutral in the 2020s. Carbon-neutral heating is the single most important factor in reducing greenhouse gas emissions in Espoo. Currently almost 25% of Espoo's district heat production comes from carbon-neutral energy sources such as biomass and excess heat. 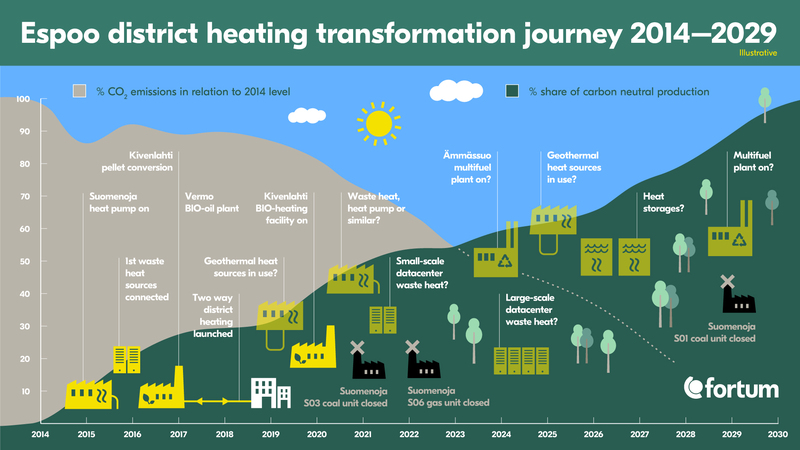 In 2020 Fortum's new bio-heating facility will replace an old coal-fired boiler and thus reduce CO2 emissions by up to 90,000 tonnes per year, which is about 14 per cent of the current CO2 emissions created by district heat production in Espoo. We at Fortum are building carbon-neutral district heating with a special focus on non-combustion and electrifying heating technologies. The share of non-combustion production is targeted to exceed 30% by 2023. Our new solutions are based on our two-way district heating network, which enables us to operate as a flexible part of the future sustainable and smart energy system, for example in energy recycling and storage. We are already utilising excess heat from sewage water, data centres and other buildings in our two-way district heating network. We are also examining the possibilities of geothermal heat and heat storages; the Suomenoja power plant already operates an 800-MWh heat accumulator. We also provide our customers and end-users solutions to save energy and control building temperature conditions.